The company eliminated stock grants and bonuses as part of its recently announced plan to increase wages. But it now says it will roll out additional raises to workers for whom lost stock and bonuses would mean a compensation cut. 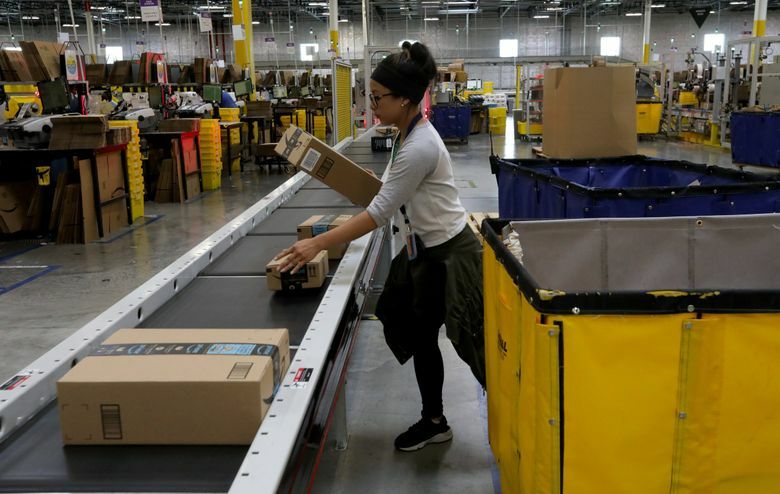 Amazon says it is making adjustments to its wage plan to ensure warehouse workers receive the pay bump they were told was coming when the company promised a $15-an-hour minimum wage. The Seattle company won plaudits from politicians and labor groups when it said it would set a higher starting wage for hourly logistics and customer-service employees beginning Nov. 1. But in the week since the surprise announcement, the company faced a backlash from some longtime workers who said that, because Amazon also eliminated stock grants and bonuses, their total compensation would shrink. Amazon, still explaining the coming changes to employees three weeks before they are set to take effect, appears to be incorporating additional boosts to account for the elimination of those stock and bonus programs. A spokeswoman said Wednesday that the company would roll out additional raises to workers for whom the lost stock and bonuses would mean a compensation cut. Hourly bumps so far have amounted to 25 cents, 50 cents, and as high as $2 an hour, depending on the facility and the employee’s tenure. That’s in addition to the $1-an-hour raise promised to workers who already made $15 an hour or more. The company also plans to replace stock awards given on employment anniversaries with cash bonuses totaling $1,500 after five years, and $3,000 every additional five years after that. The company’s communications with its hourly workers — 250,000 people in the U.S. spread over more than 100 facilities and multiple work shifts — has been uneven. One worker said he was informed late last week of a pay increase that left his hourly rate below $15 an hour. His manager didn’t mention more was coming on Nov. 1, or offer any details about the soon-to-be-eliminated perks, he said. The employee, who asked for anonymity for fear of being fired, said he first heard about those details from the media. “There isn’t much transparency” with front-line workers, he said.